Congratulations to Cynthia, the winner of Theresa's giveaway! Thank you to all who participated. 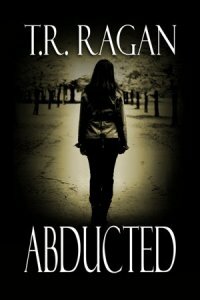 By the time I sat down to write Abducted, I wasn’t thinking about selling to a publisher, I was thinking about killing characters, every single character that got in my way. If a secondary character didn’t cooperate and/or inspire me…BANG, he’s dead. Main characters can’t spit out fascinating dialogue, BOOM, a bomb went off. You get the picture. They all had to go. And it worked. For the first time in years I was having a great time writing fiction. Forget about the nightmares I had while researching real-life serial killers…a minor inconvenience. I was on a mission. I was writing Abducted to release some frustrations with the industry, and when I wrote The End, I felt re-energized. Writing Abducted was definitely therapeutic. Although some characters are tortured in Abducted and the story has been called “graphic” and “gory,” the story is really about how people can overcome horrible life events and not only go on to lead normal lives, but also make a difference in other people’s lives, too. Do you remember the last time you read a book where you were surprised or even shocked that a particular character was killed off? Theresa is giving away an ebook copy of Abducted and Dead Weight to one lucky commenter. Elizabeth Gardner (Lizzy) is seventeen-years old when she tells her parents she's going out with her girlfriends. Instead, she meets up with Jared Shayne, her boyfriend of two years. As she walks home beneath an inky black sky, her perfect night becomes her worst nightmare. Fourteen years later, Lizzy is a licensed PI known as the "one who got away." When she's not searching for runaway teenagers, working on insurance scams, or talking to her therapist, she's at the local high school teaching young girls to defend themselves. But her world is turned upside down for the second time after she receives a call from Jared Shayne. He's an FBI special agent now and he needs her help. Lizzy has no plans to get involved. Not until Jared tells her the kidnapper left her a personalized note. Giveaway ends 10pm EST April 19th. Please supply your email in the post. You may use spaces or full text for security. (ex. jsmith at gmail dot com) If you do not wish to supply your email, or have trouble posting, please email justromanticsuspense @ gmail.com with a subject title of JRS GIVEAWAY to be entered in the current giveaway. I am interested in reading your books Theresa. It sounds like you had an amazing time writing them. Yes, I was shocked when R.R. Martin killed off Ned. I really liked him too!!! Right now, I feel about ready to murder my dissertation project, and (possibly, completely fictionally :P) my advisor. It can be so cathartic, haha. My most recent I-can't-believe-you-really-killed-that-character! moment is from A Game of Thrones... was absolutely stunned when George R.R. Martin actually went through with beheading Ned Stark. I mean, granted, it was obvious it was coming, but I was sure Stark was going to pull off some miraculous escape. Hi Janet, yes, I did have fun writing Abducted. Thanks for stopping by! LOL, Cris, sounds like you definitely need to throw a little fiction into your dissertation. ha! You and Janet both mentioned Ned. I've heard great things about that series. I need to make more time for reading! Glad to hear I am not the only person who has found Game of Thrones upsetting when the people I like are gone! When can we expect to hear more about Lizzy? Hi Shelba, thanks for asking. Book #3 of the Lizzy Gardner series should be available by the end of the year. I can see how killing off characters especially villains can be therapeutic. It's nice to see the bad guys get what they deserve and even more so when the good guys get to be the hero. I used to worry about the number of people I maimed and off-ed in my books, then a therapist told me it was better done on paper then in real life! Yes, writing is great stress relief. Cynthia, that's hilarious! Thanks for sharing. And you make a good point...writing ANYTHING is generally therapeutic. Hi Colleen. Thank YOU for stopping by. I appreciate it. I read a book where the main character died, but was later revived in a different form. Hi bn100, Ha! Tricky. Thanks for stopping by. Theresa, Abducted was one of my favorite reads for last year, and I think a lot of the reason was because unexpected things happened. I'd nearly quit reading a couple of years ago because I got tired of the same old, same old. Then I discovered Indie authors and got excited again. Stories that the big publishers had turned down because they didn't fit the mold were exactly the kind of books I wanted to read. Off the top of my head, I can't think of any characters I was surprised when they ended up being killed, but my hero in the current book may find himself in that position if he doesn't start cooperating!